As I work to improve my sketching, particularly around things like scale and perspective, I often find it easier to start to with a photo. I don’t always do this, but I find it effective to learn the more technical side of the art – and I also just find it really enjoyable. 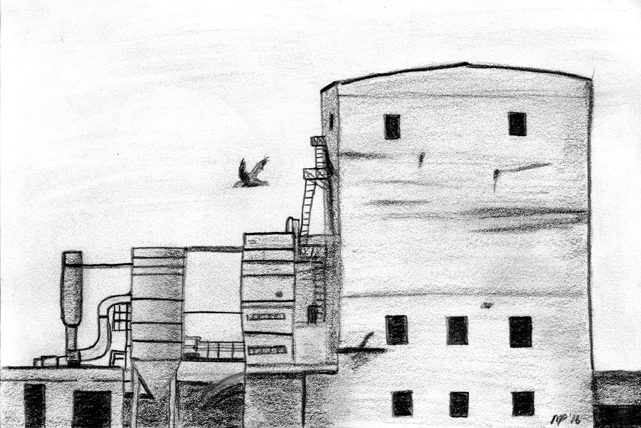 This sketch is based off an a photo I took about 6 years ago of the Owen Sound Grain Elevator. You can see the original here. This entry was posted in Landscapes, Random Goodness, Sketches, Theory and Technique. Bookmark the permalink.